Gravity waves, space time fabric, quantum gravity, gravitons! Arrgh!! There seems so many examples of science saying that gravity is this or that.. but how does it actually work? This is the question that so many people ask yet so many scientific theories don't try to answer. My research field is quantum information theory, which is looking at how things that seem plain random seem to make it through to become stable things in our every day world. One aspect of this research is how the stars and planets interact and move over epic distances, yet as if by magic seem to remain fairly predictable. The image above shows how space time is really like a 3D fishing net of energy that can travel through almost anything. As objects like planets travel through this 3D fishing net, some of the net is "pushed out" and causes waves to travel outwards into the galaxy. It can be hard for our heads to understand how a wave that is travelling “AWAY” from a large object making it could cause smaller objects to be strongly attracted to itself. In the image we can see how the large waves being radiated (in 3 dimensions) by the large object, pass through the smaller satellite. 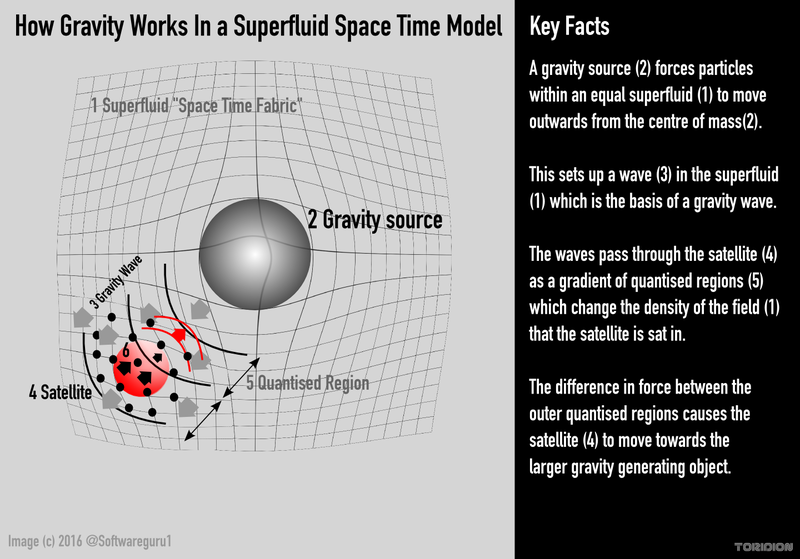 The satellite is indeed creating its own waves, but its waves are initially smaller AND they are less dense across its volume (width x height x depth) due to the gradient of superfluid space-time being setup by the incoming wave. Within superfluid quantum gravity, it is hypothesised that these waves “quantise” -(in this context 'divide') the satellites mass into a sort of unequal set of slices. The differences between the slices further away and those closer cause force to be generated across the entire satellite body. These forces being now of less strength on the inner (centre of gravity side) cause the satellite to actually move towards the body creating the larger gravity wave. Click here to learn more about how superfluid gravity theory has been used practically to forecast Earth climate such as El Nino. I also have a working paper called "A Theory of General Quantised Gravity in a 4D Superfluid Non Empty Space and the Source of Ancient Frequencies of the Solar System" which discusses the subject in some more detail.